Welcome To The World of Atomic Honey! Also, of course we are so super stoked by the album cover, done by the lovely @ravenval (aka our lovely gatekeeper). If you click on the fabulous picture you can see a larger version of this as well as many other of Raven's fantabulous creations on her deviantART page. We want to thank you all for amazing love and support and hope you will enjoy much of the material on this energetic EP. We're super excited that our much awaited LP "Operation: Moondust" has been released to the public-and so is @ravenval the lovely keeper of our garden gate who provided us with this awesome pic after receiving her copy of the LP. It is only available as a physical CD-there will be no downloads for this album, and only available on CDBaby until probably the last week of November. After that it will be available almost everywhere you can name-both online AND local retailers. 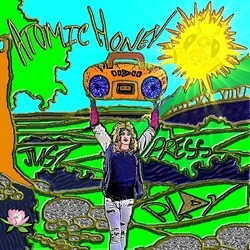 Click on this link http://www.cdbaby.com/cd/atomichoney2 if you'd like to sample tracks from the album. You can purchase there of course as well, if you like, but we understand you wanting to wait until it's available on your favorite site. The very 1st custom skate deck of Atomic Honey is now available to the public. Canadian Maple, USA made. The very 2nd custom skate deck of Atomic Honey is also now available to the public. Canadian Maple, USA made. Our New EP "GO!" Now Available For Digital Download~Yay!